"Travel far and wide but you gotta come back to the roots"
Such an enlightening thought for a nomadic wanderer like me. I have traveled to places across states, seas, and oceans but at the end of it find solace as I land in my hometown. I may have not lived enough to call it that but then someplace has to have your heart and this is that place. While one may hope that I have covered this coolest city of India in one of my detailed articles on tourism but nothing comes before it is destined to occur and so was this one weird thing. I recently realized that I have not really put down a write-up introducing readers to touristy aspects of my city. So here is one. I have traveled to these places across the town in multiple trips and hence it would be an impossible job to tie it all in a story. It is because of this reason that I am putting this up as a list of places one may consider visiting. The city of Jaipur located about 250 kilometers from Delhi, is the capital city of the state of Rajasthan. It is believed to be the first planned city of India. The initial rulers of the region had planned to set up the capital in a suburb town called Amber, about 20 kilometers from Jaipur. As per the plan a majestic fort was built and residences in-house with the fort. About 3 generations of rulers reigned over the kingdom of Amber. However, as Raja Sawai Jai Singh took over the reins of the kingdom, at a very early age, he realized soon enough that the capital at Amber was not sustainable. The logistical and strategic requirements of a growing kingdom necessitated the capital to shift to Jaipur. Thus, in 1727, was laid the foundation of a well-planned city with a lot of supporting factors in place to facilitate the building of an effective capital. The city was divided into various sectors, each serving a specific purpose - from royal residences to administrative centers to areas for civilians. The city got its famed nickname as "The Pink City" in 1876 when Maharaja Ram Singh had the city painted pink for the visit of Prince Charles and Queen Victoria as pink was considered to be the color of hospitality. The city is today a major center in the western part of the country and enjoys rich historical, cultural, economic and administrative significance. The city has preserved its history in shape of innumerable monuments and museums and proudly offers a glimpse into all that it has gone through and all that has gone through within its realms. With this article, I take you on a joy ride across the Pink City, my hometown. This marvelous building located right in the center of the city was historically the royal seat of power. The kings ruled from this place and controlled every aspect of their kingdom. This is a complex arrangement of courtyards, gardens, gates, and buildings. While the foundation was laid down by Raja Jai Singh, the palace itself has expanded and reached its today's form over sanctuaries. Different part of the palace was built in a different era by then kings and hence carry over their individual identities. The Palace has been designed according to a 'grid style' and houses various structures such as, 'Chandra Mahal', 'Mubarak Mahal', 'Diwan-I-Khas' and the 'Govind Dev Ji Temple. The walls and gates are ornately designed to Mughal style, with various murals, lattice, and mirrors adorning them from sides. Hawa Mahal, Hindi translation for Palace of Winds, is a popular landmark in one of the busiest areas of the city. Built in 1799, the building built in pink sandstone has innumerable small windows across the entire wall which give an illusion of honeycombs. The windows act as an ingenious cooling system allowing a breeze of air throughout the inner rooms. The Hawa Mahal is best viewed from outside the City Palace’s walls on the chaotic Badi Chaupad crossroads. It is from these streets that poor city folk has looked up, wondered and marveled at the lavish and simply unimaginable lifestyles that were lived meters from their extreme poverty. Today, this iconic structure is at times becomes the representative picture for the city. Established in 16th Century by Raja Man Singh, Amber was initially the capital of Kachhawaha before it was shifted to Jaipur. The fort is located about 20 kilometers away from the city and involves a short hike from the nearest highway. There are two options to climb up, one is a motorway and the other is on an elephant. The elephant ride takes you right inside the fort courtyard and provides exotic views of the fort on the way up along with clear skyline of the Pink City. The fort offers all the exquisites associated with royal residences and military headquarters. Major attractions of Amber are Diwan-e-Aam, Diwan-e-Khas, Ganesh Pol, Jaleb Chowk, Singh Pol, Jai Mandir, Yash Mandir, Sukh Mandir, Sheesh Mahal (Hall of Mirrors), Suhag Mandir, Shila Devi Temple, Bhool Bhulaiya, and Zanana Dyodhi. If you are going up there, do not hesitate to take a guide otherwise, there are just stone walls and a lot of complexity to look at without an understanding or appreciation of why they are there. On the way back from Amber one would observe a nicely architectured building within counters of Man Sagar Lake - this is the Jal Mahal or Water Palace. The building is a low rise light-colored sandstone structure floating over the water surface. This palace was never intended to be a full-fledged residence but a lodge for Raja Madho Singh for his hunting and shooting trips. The palace has beautiful engravings on its walls and presents a picturesque scene for tourist tired after a visit to the Amber Fort. There is an option for a short boat ride on traditional small wooden boats which take you across the palace. Among scientific observatories across the world, Jantar Mantar is considered to be one of the biggest observatories. The one in Jaipur is one in series of five observatories, others being in Delhi, Ujjain, Varanasi, and Mathura. Maharaja Jai Singh was an avid astrologer and person of a scientific mindset and hence had these observatories built to propagate his interest. These observatories are a marvelous combination of science, religion, and art. This observatory has the largest sundial in the world and provides a lively glimpse of how time was arrived at in earlier times. fourteen major geometric devices for measuring time, tracking constellations and, even for, observing the orbits around the sun. The center is truly a testimony of the advance science and culture in ancient times. According to history, the Birla temple was built in 1988 on the land given to the Birla family (a business family) by the Maharaja, for just a token sum of one rupee. A contemporarily designed temple built in white marble is an architectural marvel of the city. The temple is devoted to Goddess Lakshmi and Lord Vishu and is also known as Lakshmi Narayan Temple. Delicate carvings of Hindu symbols and ancient quotes from the Geeta and the Upanishads ornament the walls of this fascinating temple. One can also recognize the mythological events engraved on the wall. According to legends, King of Mawali (Mewar) while returning from a long journey to his palace wished to establish a temple at the first halting point of his bullock cart that was carrying the huge idol of Lord Ganesha. His cart became resistive and stopped at the foot of the Moti Dungri hills which lead to setting up of Ganesha temple at this place. Taking into consideration Lord Ganesha as the God of wealth, wisdom, prosperity, knowledge and auspiciousness, people from diverse religions pay their visit to this the temple to seek out the blessing. Lord Ganesha is Lord of Mercury, therefore, Wednesday is deemed to be celebrated as Ganesha’s day. In this respect, a fair is organized every Wednesday at this temple. A small hill located in the heart of Jaipur. Moti means Pearl and Doongri mean small hill and therefore the name Moti Doongri symbolizes a pearl hill which is truly depicted by its look of a Drop of Pearl. Moti Dungri hilltop is a true representation of Scottish Castle. The palace in past was residential premises of Sawai Man Singh II (last ruler of Jaipur). This palace is now a private property of this royal family and restricts public entrance except the Lord Ganesha temple which is the highlight of this area. Both the palace and the temple are true architectural masterpieces. In the evening, the hill fort provides mesmerizing views in the evenings when giant walls are illuminated with glittering lights. This is a popular movie theater which was traditionally believed to be one of the largest screens in the country. It has attracted tourists visiting the city for long. While one may feel that it is a waste of time today when we have multiplexes in every city but the architecture, history, and local significance attached to the city are worth visiting this place if for nothing else a short movie break at the end of a tiring day. Call it a hotel or a restaurant but it is, in fact, none of these attributes that bring it on the tourist map of the Pink City. This place is not where you just go out to for a dinner or stay. Visiting this place is an experience worth cherishing for long and hence you start your dinner at around 4-5 PM to try at least the best offerings it has for you. If you want to experience it all in every nook and corner, you better plan for a repeat visit right away. You start at the entrance does with traditional Rajasthani design, the theme which is prevalent throughout the campus in abundance. You are served with local cuisine, one part at a time in individual huts scattered everywhere. The bread is cooked fresh and served smok-ing hot. There are rides to enjoy including those on camels, elephants, and boats. The entire experience is marvelous and a great time to spend a good evening. This is a revolving restaurant build in one of the posh localities of town. The restaurant is part of the Hotel Om Tower on MI Road. We visited there for a quick lunch before our train and really liked the setting. For a city like Jaipur, they have set up a smooth conveyor belt to carry all the seating area around a circular periphery providing a wonderful view of the city. However, we were appalled at the food as none of the menu items were up-to-the-mark. Even a replacement for one of the dishes was as bad as original making us believe that it was not a one-time fallout. This is a famous eating joint in Johari Bazaar, the jewelry market, and is traditionally a must go for anyone visiting the city. While it started as a simple sweetshop, today, it is a complete restaurant. While I personally prefer having chat or Indian snacks, especially aloo tikki, and dahi bada, people do praise their royal thali too. We have been going to this place since childhood and have a number of fond memories of multiple celebrations, I feel that the place has deteriorated off late. The service standards have gone down with the new staff not appreciating the rich heritage the place enjoyed. This is one of the first shopping malls to come up in Jaipur and is located in one of the poshest areas - Malviya Nagar. A tall building with a decent courtyard is what this place is structurally but provides brands of national repute. The courtyard provides a number of small eateries serving street food - hygienic yet economical. One of them is popular for its jumbo sandwich, half of which is a meal in itself. 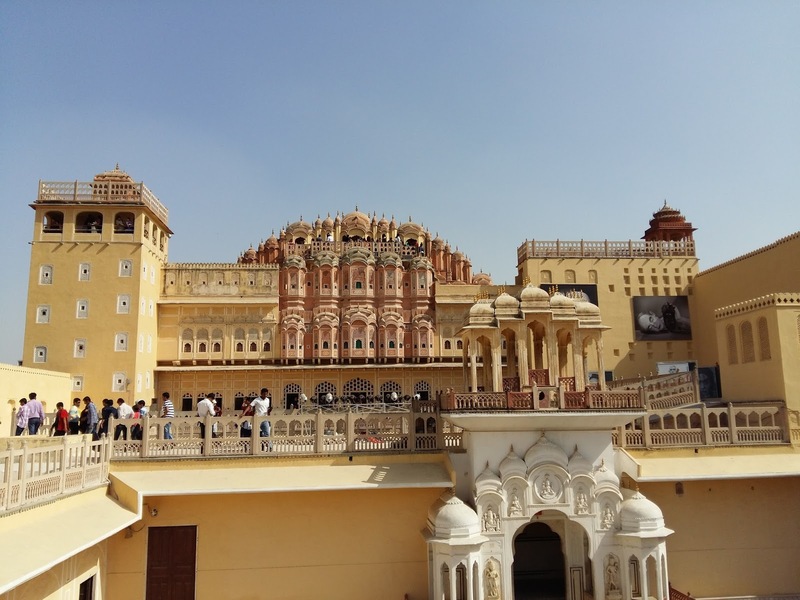 It is situated in Malviya Nagar, Jaipur, the famous tourist attraction World Trade Park Jaipur was inaugurated by the Bollywood star Shah Rukh Khan, who was the investor too. The building has two different blocks; one in North and other in the South separated by a city street. The two buildings are joined by a bridge, which has restaurants. World Trade Park Jaipur provides the facilities for office meetings, entertainment, shopping and much more. It has separate corridors for conference meetings, hotels, clubs, Multiplexes, shopping centers, theaters and much more. The place consists of the one stop for all the popular brands. The Zara Showroom has opened to a new look in World Trade Park Jaipur. The south block of WTP is especially popular among shopping freaks. A huge variety of national and international brands are present. Ranging from handicrafts and textiles, gems and jewelry, everything is present here. This is a small glimpse of my hometown where I tried taking you to key landmarks and places of tourist interest. I really hope you would be nostalgic about your earlier visit to the city or would be encouraged to plan a trip to the Pink City soon. Do let me know if you would want a helping hand in planning your trip. And yeah, do remember to put down your comments to provide a feedback to the article.